Who Pays a Special Assessment When a Condo is Sold? People kinda freak out when there’s a special assessment being talked about at a condo – especially when they are thinking about buying that condo. I don’t think there’s anything wrong with a special assessment any more than there is with someone getting a new furnace for their house. Things break, and replacing and fixing those items costs money; these items are sometimes necessary. However, no one wants to buy a property and have to pay to fix an issue right away. And if you do need to pony up, you might want to take it into account when deciding on a reasonable purchase price. So, if you are buying a property and there is a special assessment coming soon or already charged, who is responsible for it? A seller has a condo for sale since February 15th. 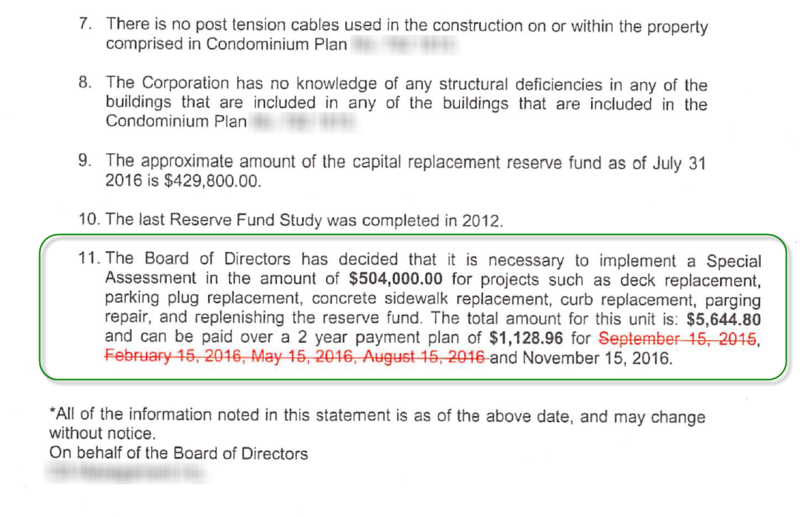 On June 1st, and the condo board decided on having a special assessment of $2500. The seller gets an offer on April 5th, and possession is on June 20th. Since the completion day is after that assessment decision, then the seller has to pay the special assessment. Say the seller has the condo for sale starting February 15th and she sells her condo on February 26th. Possession is on May 31st. The board decides that a special assessment is due on June 1st. Then the buyer would be responsible for the special assessment that gets decided on June 1st. If the buyer had taken possession just a couple of days later, they would have had that special assessment paid by the seller instead. Here’s where it gets to be important when you’re a buyer. You need to look at the condo documents and try to find out if there is going to be a special assessment passed after you take possession. If it happens before, then you’re not responsible. If it happens after you take possession, then you have to pay. Don’t forget, this doesn’t matter if the payment is due a year from the decision or the next month. The key is when was the special assessment decided on. That decision is the point at which it becomes the responsibility of the owner to pay. Not the due date. This is one of the many reasons its important to know the terms of the contract. We as real estate agents work for both sides – we don’t have one purchase contract for buyers and one for sellers. The contract needs to be as fair as possible for both parties. But it’s also important to know about special assessments and to read the condominium documentation. Here is an information statement that mentions a special assessment. Since it was already decided, this had to be paid by the seller. Even if it is due later on – even if the unit is sold. I’ll give you an example of a transaction that never went together. I had a client who wanted a certain townhouse in Edmonton, and it was a really nice place. When we got the documents, there was one annual general meeting page that briefly discussed the possibility of a special assessment to pay for the siding to be upgraded on all the townhouses. I thought this might not be that expensive, but when we looked at the reserve fund study (or depreciation report), it said that the siding was going to be 1.5 million dollars to replace. And this siding was causing issues already with water leaking in around the windows. It needed to get fixed or replaced. There were 166 units, but that still meant about $9000 per unit. There wasn’t an extra 1.5 million dollars in the reserve fund, so this would have to be paid out by the owners of the townhouses. Now there is nothing wrong with getting new siding, and like I said, buildings need to be maintained, but my client was not interested in paying $9000 so soon to get his unit fixed up. If that was the case, it didn’t seem like such a great deal any longer. If we didn’t see the condo docs mention the special assessment was likely and what the amount would have been, we may have missed this potential issue. I had asked if there were any special assessments and the seller’s agent said there were none at this time. And that was true! But we were not worried about any at that time, we were worried about one in the future. The date it gets decided on is the date that affects who pays. This article pertains to real estate transactions in Alberta that are facilitated by the Residential Resale Condominium Property Purchase Contract that was updated in September of 2016. I have a peculiar scenario developing which is not covered here. We trying to buy a property with closing of August 1, 2018. The property had an extension done to it for which the permit was taken but not closed i.e. the city did not approve it technically. it was 9 years ago. The seller, I believe in good faith, didn’t know the process and I asked them to sign a condition in Sale and purchase, that the extension was legal and approved and that they must give me the relevant paper work. The Realtor called the city and found out the permit was not closed. Now they are getting the inspection done in a day or 2. My concern is – if, after approval, the city increases the assessment of the property and thereby the property taxes, worse, if they back date it to 2009 and give a bill for the arrears, who is responsible for it? It may not happen by August 1, who knows! What can I do to protect myself? What is worse is that the owners don’t even live in the country any more. It is best to check with the professionals you have working for you, or the authorities in charge. This is a question better directed to your real estate agent or your lawyer. You can also call in to the Edmonton Planning and Development Office. Can a condo association charge owners who rent for higher usage of common elements and amenities? If so, can a condo association also back charge a smaller one time fee For having had renters over 1 year ago? 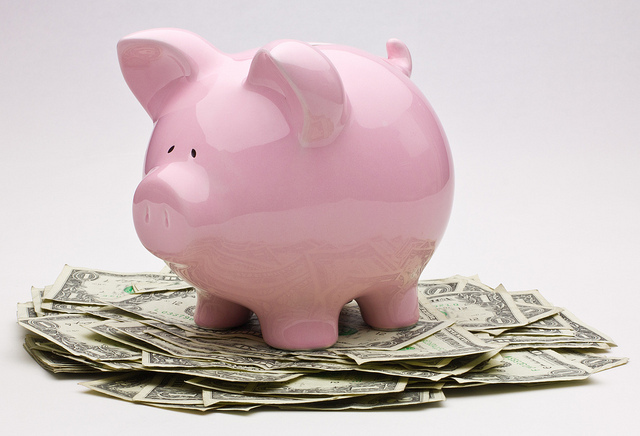 Example: A condo Assn starts charging for the upcoming rental season, if legal and approved. But, can a condo association also charge a small one time fee for prior renters (high usage)? If an owner has rented x 10 years and other owners have rented less than 2 years, can a condo association charge a one time fee that would be higher for those who have rented x 10 years and a different lesser fee for those who have rented less than, say, 2 years? Is this legal? Hi Deborah, Your IP suggests that you live in Texas, so I am not sure what the laws are there, but that doesn’t make much sense to me – it seems rather complex. Perhaps there are provisions for this situation in the condo bylaws and the laws in your state. I would check the condo bylaws for rules about renters and if there is a fee schedule attached. That would help to explain a lot.